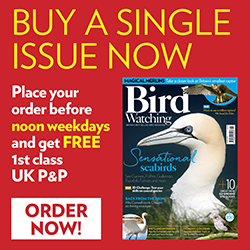 If you’re new to the Neotropics (Central and South America and the Caribbean) be prepared for a bold palette of avian colour, bird families you have never encountered before, and some identification challenges. This country is home to Tinamou, Guans and Chachalacas, Trogons, Motmots, Toucans, Parrots, Woodcreepers, Leaftossers, and no less than 38 Hummingbird and 58 Flycatcher species! If you’re an old hand there are still some compelling reasons to visit Guatemala; specifically Azure-rumped Tanager, Pink-headed Warbler and Horned Guan. These three will raise the heart rate of hardened, battle-weary world-birders. Add Resplendant Quetzal and you have Guatemala’s ‘big four’. We arrived late at night, but that didn’t prevent an early start (a recurring theme!). In dim light we walked to the van through the cobbled streets of Antigua Guatemala, a World Heritage city, with a volcano outlined in the distance. St Cristobal el Alto was our destination, not far from the city and 1900 metres above sea level. It was low-energy, high-impact birding, with little walking involved. Layer upon layer of volcanoes were laid out before us, scrubby, wooded, and misty. A Golden-fronted Woodpecker showed well, high on a tree snag. There were three Bushy-crested Jays, with dark heads and turquoise backs. A blob in a nearby tree turned into a tiny Ferruginous Pygmy Owl – blobs are good at that sort of thing. Three Gray Silky Flycatchers came over, long-tailed, with bubbly calls. They perched – and were indeed silky grey, with white eye rings and yellow vents. A hummingbird whizzed out from a tree – Azure-crowned. Golden Olive Woodpecker… Lesser Goldfinch… Acorn Woodpecker… The mist was clearing, slowly. A Band-backed Wren flicked its tail, calling roughly. We scoped an Elegant Euphonia, a small finch with a very, very blue head – a blast of colour. Two Rusty Sparrows put in an appearance – at 19 cm long, these are big sparrows, with a dark moustache and a rusty crown, and a voice reminiscent of Cetti’s Warbler. Then there was a scene that looked like a photo-composite but wasn't. One tree snag, a male Red-breasted Grosbeak at the top, two male and two female Elegant Euphonia further down, and three Gray Silky Flycathers. All at once. Honest! A Townsends Warbler… a Boat-billed Flycatcher... I was overwhelmed already, but it was time for a gorgeous al-fresco breakfast, with 16 distant Gray Silky Flycatchers, and a much closer Hermit Warbler, one of countless North American Wood Warblers that can be seen here. Then to Finca El Pilar, a private montane forest nature reserve, complete with hummingbird feeders. If you feed them, they will come... and they did – four species in a minute or two – Rufous Sabrewing, with a white stripe behind the eye, cinnamon tail corners and underparts, a species found only in Guatemala, a bit of Mexico, and El Salvador; Magnificent Hummingbird – a very large hummer, black and green with a white spot behind the eye, and green on the throat – but only when the light is right; Azure-crowned again, and Berylline, with white trousers. Coffee was grown here not so long ago. Then forest moved in; big trees and hanging lianas shrouding the mountainsides. We left Antigua Guatemala early(! ), saw White-eared Hummingbird at a feeder in the breakfast stop car park, then strolled into pine forest, 2200 metres above the sea. We were looking for Pink-headed Warbler, a bird the colour of red wine, with… a pink head. There are perhaps 50,000 left, but you can only see them in Chiapas (a southern Mexican state), and Guatemala. Deforestation means its future may be less rosy than its plumage. They didn’t prove too tricky to see but were none the less special for that. The first of the big four came easy. Tecpan had more delights up its forested sleeve…a Crescent-chested Warbler found in Central America and Mexico, eating a caterpillar. A Mountain Trogon – perched quite high, its chest pumping out its electronic call. A Spot-crowned Woodcreeper – in essence, an oversized Treecreeper. A Blue-throated Motmot called, ‘pooh-pooh-pooh’, but was secretive. Eventually, we saw it. The Motmots are related to Kingfishers and Bee-eaters. Most have distinctive tail rackets – this species doesn’t. The strikingly marked Chestnut-sided Shrike Vireo is one of those birds that when you see it illustrated, you want to see for real. It’s another species found only in Chiapas and Guatemala. ‘Ours’ perched high, giving a drawn out whistle. A small group of Band-backed Wrens rattled noisily – I don’t know who would back that band. The Hairy Woodpecker had buff, not white, underparts – it was the Guatemalan subspecies. This remarkable lodge and private nature reserve sits on the southeastern side of Atitlan Volcano. Over 340 bird species and more than 270 butterfly species have been recorded on its 1300 hectares of forest and shade coffee plantation. It looks after its people too, providing income (to highly competent local bird and wildlife guides for example), education (including nature studies and conservation), medical care and even a church for 60 Maya Kaqchikel families who live in the protected area. Los Tarralles stretches from 700 metres to a pulse-quickening 3500 metres above sea level. There is a lot to see here, and we spent two days looking! A Cinnamon Hummingbird welcomed us, its long white tongue flicking in and out of a blood-red, dark-tipped bill. Black-headed Saltator… Spot-breasted Oriole… Yellow-winged Tanager… Orange-chinned and Orange-fronted Parakeets. A Tayra (a giant relative of the Pine Marten) ambled through the treetops. We followed the path into forest, passing bamboo of outrageous dimensions. It was still, sweaty and humid. The stars that afternoon were ‘Toledo’ birds, named after their electronic te-tu-tuu call. They’re not called that in the field guide of course - their proper name is Long-tailed Manakin, one of 50 or so species that make up this Neotropical family famed for complex courtship rituals and lekking. We saw a male, blue on the back, red on the nape, 10 cm of body, 15 cm or so of tail, and then another male, 'te-tu-tuu'. By 5.30 pm the light was fading. Two Yellow-naped Parrots came over on shallow wingbeats. A Grayish Saltator, two White-bellied Chachalacas, peculiar turkey-like birds with red throats, Pacific Parakeet and Vaux’s Swift completed the day’s notebook entries. By 0610 the next morning, after a spell in a four-wheel-drive, we were in secondary forest looking for Azure-rumped Tanager. It’s a special bird, with a small ribbon range, reaching from southern Mexico into Guatemala. 7000 is the top end of the population estimate, and they occur in maybe half a dozen sites in Guatemala. My old field guide to Mexican birds says ‘extremely rare; only 2 specimens known’. It took time, but we saw one, at the nest, high and distant – the first known nest in Guatemala this year. That was the second of the big four. A Long-billed Starthroat put in an appearance – a hummingbird with a cool name and a magenta throat. A White Hawk perched obligingly and a male Painted Bunting showed off its colours, straight out of a six-year old’s paintbox. The cicadas made a dreadful noise – it sounded like their batteries needed replacing. A White-bellied Chachalaca called, ‘chachala, chachala’, and a Smoky-brown Woodpecker drummed, then appeared. We went higher for another al-fresco breakfast, with Turkey Vultures, a King Vulture and a Black Hawk Eagle against the backdrop of Atitlan Volcano. We were in coffee-growing territory and it was flowering, and good for birds, with Prevost’s Ground Sparrow – large, with a rufous crown and cheek patch, and a Buffy-crowned Wood Partridge. There was a much closer encounter with Azure-rumped Tanager, when you could see the azure on the wings and rump, a stunningly red White-winged Tanager, two Turquoise-browed Motmot, as good as you imagine, with tail rackets, Blue-crowned Motmot and Tody Motmot – hard to see, shade-loving and secretive. The Northern Potoo, more cryptic than the SAS, was doing a convincing impression of part of a tree, watching through notches in closed eyelids. I could write more about Los Taralles… but another part of Guatemala beckons. We started early and drove into the highlands, 2400 metres above sea level. It was cool, sub-tropical forest clinging to volcano sides, with bromeliads and tree ferns, and Santa Maria Volcano standing proudly in the distance. A Unicoloured Jay made itself obvious on top of a conifer, a tasteful blue, with black accents on the wings and around the eyes. What sounded like a voice-coached Corn Bunting was singing – that was a Brown-backed Solitaire, a high altitude thrush. There were more hummingbirds, and Pink-headed Warblers again! A bird with a cinnamon belly poked around flowers looking for food… it was a Cinnamon-bellied Flowerpiercer, searching for nectar. While we birded, people bathed in the hotbaths. Birding continued in the restaurant – a Ruddy-capped Nightingale Thrush moved from table to table. We left before 10am, descending through super-fertile farmland where radishes are the size of tomatoes. A Horned Guan is the size of a turkey, lives in trees and is only found in parts of Guatemala and Chiapas. BirdLife International classify it as ‘endangered’ and estimate its population, conservatively, at 1000-2499 individuals. As you would expect, this Guan has a horn – a red sticky-up casque on its head. No other Guan has the audacity to sport such an ornament, but the Horned Guan doesn’t let many people see its horn, or any other part of itself for that matter. But we are going to try. Up early, out early, and in a boat early, we speed across Lake Atitlan, Central America’s deepest. A Great Blue Heron sits on the water like a duck. We pass an Osprey, some Lesser Scaup, American Coot and Laughing Gull, then dock at San Pedro, walk a little, and climb into the back of a pick-up truck, heading for San Pedro Volcano National Park. By 0635 we are walking, through flattish, wooded habitat, and the mist is clearing. We stop and wait for a Belted Flycatcher, another ‘special’, but no show. Our mood drops. On the way down we see a Belted Flycatcher. The pick-up breaks down on the edge of San Pedro. We walk to the boat. There is thunder and lightning and I am soaked to the skin. The rain kills my mobile phone. It had been a great day. Tikal was hidden in jungle until its accidental discovery in1848. This ancient Mayan city was mysteriously abandoned around AD900, and is one of a handful of World Heritage Sites listed for both their natural and cultural importance. In the morning half-light, we saw a Pauraque ( a nightjar) on the track, a track that takes us to a pond. The pond is home to a Yucatan endemic, and there were two of them here, one about two metres long. Morelet's Crocodile was a lifer for me. They didn't feel threatening but I noted the position of a ladder and raised platform, just in case. Something smaller came into the open - Gray-necked Wood Rails, with pink legs and a rich buff wash underneath. We saw some of Montezuma’s Oropendulas here - birds that weave remarkable hanging nests - and a Green-breasted Mango, on its nest above us, head and needle-bill projecting over the edge. As we headed towards the car park we encountered another limited range species, six of them, the size of turkeys, strolling around like country estate peacocks, only these were wild – Occellated Turkeys. Even the car park was great for birds… with Gartered Trogon, a Collared Aracari (a toucan) on a wing mirror, two Keel-billed Toucans, parrots and a parakeet. And then, beside a nearby pond, a wonderful Bare-throated Tiger Heron, which, not surprisingly, was a little unsettled by the Morelet’s Croc that approached it! Time for breakfast. Tikal is worth a visit for its archaeology, but there's great wildlife around those historic slabs, even during tourist times. Howler Monkey, Spider Monkey, White-nosed Coati, the eerie whistle of a Great Tinamou, Red-throated Ant-tanager, Trogons, Woodcreepers, and two tyrant flycatchers with very enjoyable names: Eye-ringed Flatbill, and Stub-tailed Spadebill - short on bill and tail! Not to mention the Orange-breasted Falcon, un-phased by tourists, and un-noticed by most of them, perched in a tree near a massive chunk of ancient history, plucking its lunch. You might think the world’s most beautiful bird would put in an appearance for a Bird Watching writer. It was a roadside café, where Quetzals encounters are recorded in the graffiti. Lorries thundered past, but the Quetzals stayed hidden. We had nice views of a Highland Guan though. Three out of four ain’t bad. Looks like I’ll have to come back. You don't need a visa to visit Guatemala. 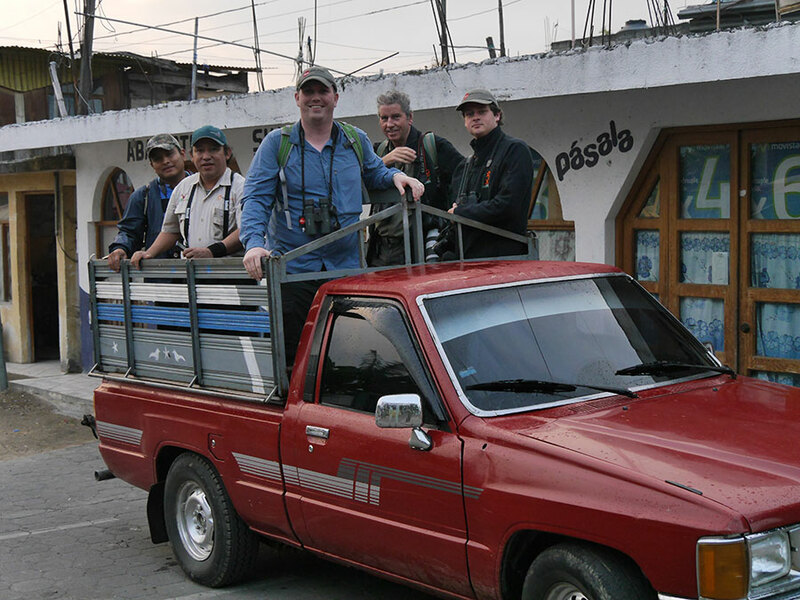 Thank you to Maynor Ovando and Osbin Aaron De Leon Lux of birdingexpeditions.com, and to all our other guides, for their time, expertise and for taking us to so many birds. Thanks to Juan Rivera and Maria Gabriela Alvarado Alejos for all they did to make the trip possible and to the Guatemala Tourist Commission for their financial contribution. Finally, thanks to Steve Bird, Tom Bird and Rob Ripma for their companionship along the way. If you want to visit, contact birdingexpeditions.com, zootherabirding.com or sabrewingtours.com.